The Nobel laureates George Akerlof and Robert Shiller highlight the crucial role “stories” play in determining economic policies and outcomes. Repeated endlessly, the stories we tell ourselves become our motivating force, impelling us to ignore contrary evidence. As Shiller more dramatically says, because a story is an “easily expressed explanation of events,” it sometimes propagates like a disease. It can “go viral.” As it spreads, he warns, the story has an “economic impact.” Often a more dire political impact, he may well have added. Well, the euro is more convenient for American tourists! That is true. Therefore the European should consider implementing The Matheo Solution (TMS), starting with Italy. In the TMS-structure all the advantages of both the single currency and national currencies are combined, while eliminating the disadvantages of both systems. I was interning on a foreign exchange trading desk around the time of the EU formation. And that was the big thing “We’ll have one single currency, and that will eliminate a lot of inefficiency” I thought, this doesn’t make sense as there is an extremely active market in exchanging one currency for another, what is exactly the great inefficiency? Turns out the EU is nothing more than a pretext for the subversion of individual European countries’ sovereignty. Well that is not what the majority of their people’s want. They identify with their country, be it France, Italy, etc. whatever more so than a Global World Order. It’s the elites vs. the masses. I see a very big difference between the European Union (common market), and the eurozone (a monetary union unaccompanied by a fiscal union). Yeah, that’s something a lot of people miss (and I confess to short stints of absent-mindedness on it myself). Saying a person agrees to a common market vs saying one is for using one currency are very different things. Some of these cats, Trichet and Wolfgang Schauble strike me as guys that don’t really care if heavy and hard boot imprints are left on ordinary Europeans’ backs in this process were the EU starts transferring power from democratic voters to “technocrats”. Evil personified in my not so humble opinion. I’m not against a common market as long as voters of individual countries still have voting power over their own destiny. I suppose some think this is comparing apples to oranges, but it’s actually not that much of a stretch to say that these European countries like Greece, Britain, Spain etc are now fighting for their rights in a very similar way that Taiwan is fighting for its right to keep their vote. And although my voice has no leverage in that, I will still speak up or blog or “troll” for their democratic rights on that. I used to tell my mainland Chinese students (who I cared about and for more than they ever perceived) America really didn’t give a damn about Taiwan outside of believing that Taiwanese had/have a right to vote and self-determination. Of course none of them believed me, but I knew that was how it would be before I opened my mouth. Agreed. Let’s make this easy for Americans to grasp. The 50 states known as the USA are akin to the EuroZone. NAFTA created a common market (akin) to the EU for all of North America but Mexico kept its peso (even if it is symbolized with a $) and the Canadian dollar has always floated against the US$. Of course the USA is a fiscal union except for how we treat (or abuse) Puerto Rico. One thing I have to give you props for is that you are an independent thinker. And an interesting poster. Very well thought out and well written by Ashoka Mody. I want to give a better response and more thorough thoughts on this in a later comment in this same thread, but just a quick/abbreviated impression. The other thing that I think I disagreed with Menzie on (and Menzie can correct me if I am getting this wrong) is, I was pro-Brexit, and I think Menzie was anti-Brexit. This article by Ashoka Mody, although he’s not discussing Britain specifically for the vast majority of this article, really states many of the basic ideas behind my thought of “How is Brexit really ‘hurting’ Britain? ?” Short term…..maybe, even that is debatable. But when push comes to shove, having the ability to negotiate independently on trade, still having the USA on the trade phone anytime (post trump era), and the ability to control/adjust their own currency, and I am supposed to believe Britain is the “loser” here?? Sorry, not biting on that one. UK exports are mainly services tailored for the EU market. Brexit allows Europaen countries to introduce a lot of red tape and as result forces many companies to move to continental Europe. Manufacturing supply chains are damaged by Brexit. Overall the operation is economic selfmutilation on a large scale. There are no markets that can compensate for the losses in the EU. Why do you assume a different outcome? You don’t know that, no one does, anymore than Draghi knows his revisionist history of the EU. In fact most of that red tape is created by the original EU agreement, which can be tapered off over time by mutually agreeing parties. I suspect new agreements with Europe will be made over the long term which largely benefit Britain, (i.e. Europe itself compensating for the loses of EU membership) and I also suspect contrary to the dogma you end your otherwise factual statements with, there will be plenty of markets that can meet and exceed those losses over the long-term. I suspect that if Europe decided to go completely menopausal over this, that America and Canada would be more than happy to pick up the slack. But long-term Europe won’t be, because they’d be cutting off their own nose in the process. And, let me add, all of my arguments, and yours, assume EU holds together. What happens if it doesn’t?? My argument (which holds even if the EU stays unified), becomes even more strong. Sorry, YOU based your brexit argument the possibility to compensate for the loss of the EU market. Which market allows to sell UK services? How do you compensate for EU comapnies moving their UK production into the EU-27? In Asia only India is interesting because it is a large developioing market and in principle offers some advantages for UK. However, in the past it was UK that blocked EU-Indian negotiations for fear of too high immigration of Indians. Now you explanin me what will change after brexit? India will get a trade deal with the EU-27 long before the UK and India has UK wirthout the bargain power of the EU over the barrel. Do me an additional favor?? Could you tell us the current unemployment rates for France, Italy, Spain, Greece, and then tell us the unemployment rate for the United Kingdom?? Or maybe a 10 year graph showing those annual changes for those 5 countries if you prefer. I assume that this Brexit announcement has utterly destroyed UK’s unemployment numbers by now……. Maybe you can check with Jean-Claude Trichet, I know Trichet doesn’t go 5 seconds without checking those unemployment figures. Trichet’s empathy for the EU masses is only matched by HIllary’s concern for rural America. That’s why right now Hillary is on her “Please Cry for Me America” ticket selling tour of armory buildings and high school gyms. It’s just Hillary’s way of “giving back”. What is your argument? In southern European countries the unemployment was always high. Therefore, a comparison with UK is a little bit strange. That’s a very cool way to evade my question about current unemployment rates. You actually picked a very friendly year for my argument, if you look at unemployment in the UK around 1970, it’s about 4%. Recently it’s about 4.1%. Since you’ve decided to make a vacuous argument, you should have at least gone with 1982 or 1984, which was more related to oil issues than the EU. It tells me a lot, and it tells the readers a lot, that you don’t want to look at or discuss the current unemployment numbers. And I should add you’re wrong about south Europe. If we just look at Greece alone, not long ago it was in the 10% range (even below that for a short period). It is now pushing 20%. I can quote Italy, Spain, and France vs Britain if you like, but I don’t think you will like those answers either. BTW, If you think India is the only country in the world that trades goods and services with the EU, I am sorry to inform you, it is not. India is competitive in that sense because they can provide cheap labor. They win those trade deals the same way (generally speaking) that China does. Low cost labor. I doubt Britain is interested in competing on those grounds. Maybe you can ask a member of the House of Lords if he’s angry Bangladesh is killing Britain in textiles trade right now. Might be an educational conversation for you. As for Indian immigration to UK, again a very strange argument for you to make, as Indian migrants to UK are apt to benefit from Brexit. Why?? Their workers tend to be more highly skilled than other migrants to Britain, and will get better treatment post-Brexit in the “immigration queue”. In the past EU migrants got preference, and many of them were lower-skilled. Rest assured that higher-skilled Indian immigrants wanting to go to the UK are dancing in the streets about Brexit. Back in the 1970’s it was not that high. Yes the Thatcher recession drove their unemployment rate up. So did our recession around this period of time. C’mon – if you are going to make a claim, bother to back it up with facts. FYI. Income per capita is a different concept than the unemployment rate. Interesting observation. I would be curious to know if the euro has positively impacted tourism, for all tourists in and out of Europe. His graph shows Germany’s trade with China is also growing. 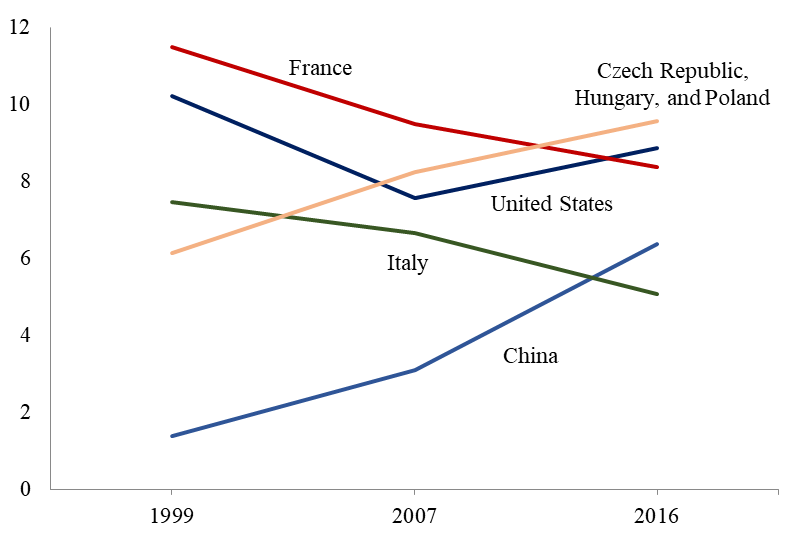 China – like the Czech Republic, Hungary, and Poland – is growing rapidly. “Value-added chains” suggests processed trade by contract manufacturers, which China is known for. It turns out that processed trade is a big deal in the Czech Republic, Hungary, and Poland. Germany is outsourcing certain manufacturing functions to low wage nations. Having floating rates hasn’t exactly slowed this down. “Western nations that did not adopt a single currency learned to discipline themselves. The learning occurred at different times over the course of the 1990s and early 2000s. In the United States, Fed chairman Paul Volcker—in a forceful show of central bank independence—raised interest rates to draconian levels in the early 1980s. Inflation fell and remained relatively low through the subsequent era of the Great Moderation. Let me add that New Zealand has maintained a floating exchange rate. They had high inflation until 1988 which was their Volcker moment. Since then, they have successfully targeted a 2% inflation rate. May we also talk about the power play, eskewed export-oriented business, transfers and outputs, and geopolitical ramifications, basically everything “non-economics”? I’ve always been curious about this, and you’re uniquely positioned to answer a question I’ve had for awhile now. Do Chinese government trolls have a daily quota you have to meet?? Moses, STOP NAME CALLING. You liberal Gestapo.